Office 365 has rolled out a new, intelligent email filtering function as of June 30, 2015. 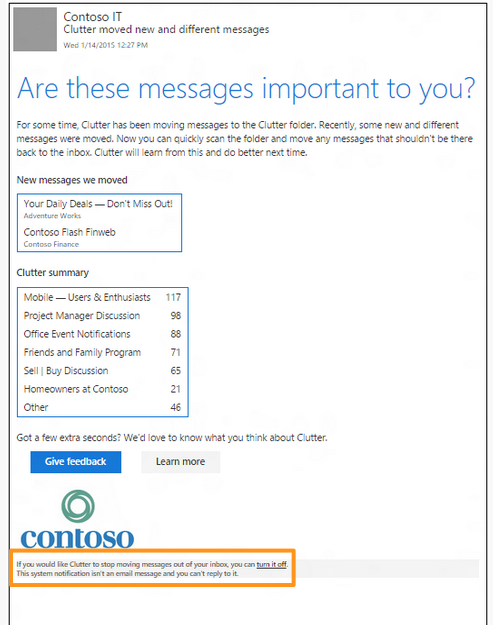 Office 365 Clutter determines the priority of emails based on the behavior of the individual user and filters them into the “Clutter” box or the inbox. Algorithms assess each email based on the content and how the user typically interacts (or doesn’t) with similar emails (i.e., opening, replying and forwarding). As the name suggests, the aim of this new function is to declutter the inbox by removing low-priority emails. So far (based on beta activity), Office 365 Clutter moves one million emails and saves the user 82 minutes per month, so all in all, this is an awesome development! From an email marketing standpoint, understandably there are some concerns (well, one mainly) associated with this function …. How does this affect my OPEN RATES?? Clearly the question on every email marketer’s lips is how this affects the all important view rates. As with the introduction of the Gmail tabs, there is some concern about how this may damage the ability to reach contacts. Fear not! In a Mad Mimi data analysis of open rates for Gmail contacts, we saw only a minimal decrease in open rates. These results are also consistent with other studies. This is particularly encouraging when the Clutter intelligence and reporting should have even less of an effect on your views. Considering the Gmail tabs filtered all bulk emails, we’re optimistic that the Clutter function, which only filters inactive emails, will keep the promotions hitting the inboxes—especially the types of promotions that recipients tend to open. Clutter also delivers a weekly summary (see image below) of all the emails that were filtered to “declutter” your inbox. This will allow contacts to take notice of some emails they may be missing and then prompt them to start engaging again, triggering Clutter’s algorithms to re-prioritize similar emails. There isn’t a way to directly affect the clutter filtering from the sender’s side, but here are a few tips you can send to your contacts to let them know how to start getting your mail in the inbox. This will give your contact a run-down of all the emails that are getting filtered by Office 365 Clutter. Similar to the Gmail “Promotions” tab, mail can be added back to your inbox, though it will take a little more effort to “train” clutter to stop swallowing some emails. If you ask your contacts to start adding your mail to the inbox, Clutter will increase the priority and start adding your messages to the inbox. You can see from the message highlighted in orange that it’s also possible to completely turn the Clutter filtering off, which you can remind your contacts to do, if they so wish. When creating a campaign, it’s always a great idea to test which factors maximize your clicks and views. This can involve testing certain subject lines and sending times in small cohorts to find out what works best on your audience. Segmenting your lists based on factors like location, gender and age — and tailoring your mail to suit that demographic — can help boost your views and get you landing in the inbox more often. 3. Using a transport rule to bypass the Clutter folder. 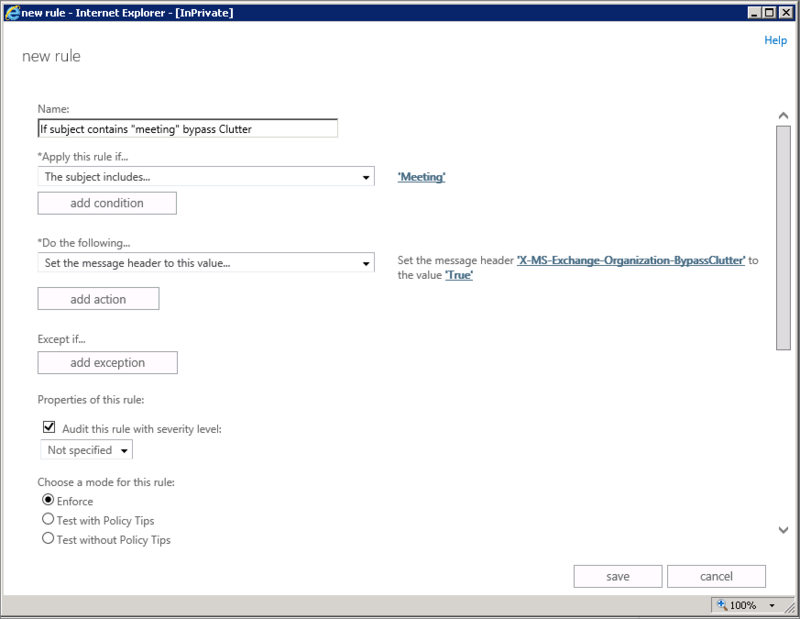 You can set up rules in Office 365 to prevent mail from landing in the Clutter folder based on the specific criteria you set.This example allows all messages with “meeting” in the subject line to bypass Clutter. It’s safe to say that nobody enjoys sifting through a packed inbox to find something of interest. My personal inbox has an influx of excess marketing emails, many of which I don’t want to read and require manual deletion. This relatively new type of in-house filtering is not only here to stay but is also expanding. Functions like Office 365 Clutter allow users to focus on the emails they want, so as senders, it’s best to embrace the positivity it brings and adapt to minimize any potentially negative effects. Clutter is an extra motivator to make your marketing emails as relevant and clickable as possible and — if you’re personally using 365, it may improve your own inbox work flow. All in all, this is a good thing for senders and recipients alike.